No-Conscription Fellowship leaflet entitled 'Shall Britons Be Conscripts?' (undated) and a letter from a retired policeman complaining about this leaflet and other anti-conscription activity in Letchworth, 15 May 1916. Many people in Britain strongly opposed the anti-conscription propaganda of 'peace cranks' such as the No-Conscription Fellowship. One retired Metropolitan Police CID inspector living in Letchworth, Hertfordshire, was so incensed by the apparently unchecked activities of the Fellowship and the Independent Labour Party (ILP) in his area that he wrote to the Home Office about it. 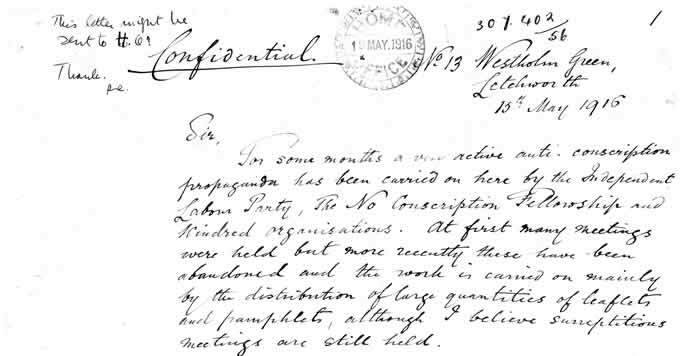 His letter, dating from May 1916 (when a second Military Service Act extended conscription to married men), shows the lengths to which some patriotic-minded citizens went to pursue the anti-war minority.